For first timers, permanent makeup can be nothing short of terrifying. After all, you’re having a form of tattoo applied to a very sensitive area of your face, so worries about pain are no doubt buzzing around your head. 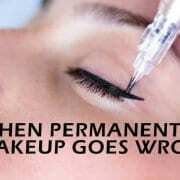 Not only that, but if your eyebrow tattoo or semi-permanent eyeliner goes wrong, you’ll have to face looking ridiculous for a really long time. But, as much as you probably don’t believe us right now, your worries are generally unfounded. In permanent makeup, nothing is left to chance, and we operate a strict consultation and perfection procedure to ensure what you end up with is exactly what you wanted. To put your mind at rest, as much as is possible at this nerve racking time, here’s how we do what we do, and how we do it so well, every time. Before we even consider undertaking any semi permanent makeup treatment on you, we’ll need to know a little more about you. There are certain medical conditions we’ll need to know about, which are usually asked by way of a health questionnaire before you come for your consultation. 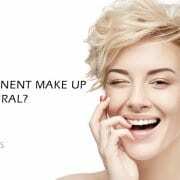 All these questions may seem a bit much (and a bit scary) but really they are just designed to make sure permanent makeup is a suitable treatment for you. If you do suffer with any of these issues, it doesn’t necessarily mean we will not treat you, only that we will be well prepared before we do. We will send you a patch test in the post, which you should carry out at least 24 hours before your treatment. This will ensure you are not allergic to any of the products we use in our treatments. If you indicated any medical or health issues, we will discuss these further here. However, the main point of your consultation is to ensure we get your semi permanent make up exactly right for you. The first thing we do is assess your skin undertones, to ensure you use the best pigment for your skin type. Most people have either warm or cool undertones, which lends them to looking best in red or blue based colours. Your personal preference comes into it too, of course, but as experienced PMU practitioners, we will give you our professional advice on which colours will look best on you. Next we will discuss the treatment you want. 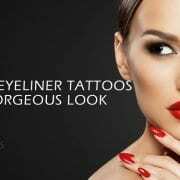 Whether it’s a lip tattoo, semi permanent eyebrows or permanent eyeliner you’re after, there are a whole lot of shapes, thicknesses and colours to decide upon. It would be good if you’ve had a good think about this before your appointment, so we can narrow down your options at an early stage, although we can also provide advice on what is best going to suit your facial shape. Once we’ve got a good idea of your ideal style, we will draw on your makeup with a pencil so you can see the shape and how it looks on your face. We will also take pictures, so you can evaluate how you’re going to look against how your face looks at the present time. Once you’re happy with the planned shape, colour and density, we’ll move on to starting the treatment. Once you’re ready to go ahead, we’ll apply a topical anaesthetic to the area which is going to be treated. This takes around 20 minutes to work, during which time you’ll be asked to read and fill in your consent forms, as well as any other consultation forms we have not yet asked you to complete. 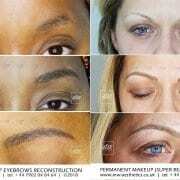 Anaesthetic is not necessarily needed; as permanent makeup is not exactly painful. Most clients describe it as a ‘scratchy’ feeling, but we find that a little anaesthetic goes a long way to improving their comfort. 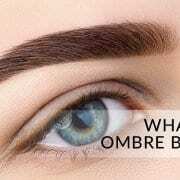 We will redraw your eyebrow tattoo, lips or eyeliner again, making sure you are 100% happy with the way it’s going to look. Once you are completely satisfied we will start the process of micropigmentation. Treatments take from one and a half to two and a half hours, depending on what you’re having done, but our outstanding numbing creams will ensure you feel very little during this time. We will give you full aftercare instructions to take home with you, as well as a soothing balm, so that you know how to look after your treatment over the coming days. Immediately following treatment your body will form a small scab over the treated area, but after two weeks this should naturally fall off and be replaced by new skin. The process of new skin growth and healing of the area can affect the colour and shape of the treated area. For this reason, we ask you to return to the clinic for a touch up around 4 – 6 weeks after your procedure. The retouch appointment will be shorter than the main appointment, and will simply be filling in or recolouring where your body has altered our work. We always take an ‘after’ photo, so that you can see the difference in your face before and after. We’ll take one after your initial treatment, and then again after your touch up. 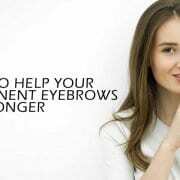 We find this helps clients to see the improvement, and to feel confident in their investment in a permanent makeup treatment. All too many clients arrive at our salon thinking we’re just tattooists with a new string to our bows. Please be assured that we are not, and that actually none of us have ever done a permanent tattoo. We are fully trained, dedicated and ambitious makeup artists, schooled in colour theory, bone structure and skin tone to the max. We have the skills and abilities to make your face look better, and will do everything in our power to make sure you have an amazing experience with us. Call us now for more in depth advice, or book an appointment to enjoy your own permanent makeup experience.